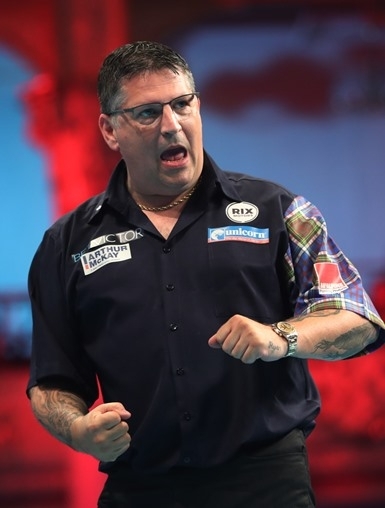 Gary Anderson justified his favourite tag on day two of the World Matchplay. He upped the ante beating Stephen Bunting 10-7 on Sunday night at the Winter Gardens. There were also key victories for fellow Unicorn stars Joe Cullen and Ian White, but Kyle Anderson bowed out. Gary stepped up when it mattered. “There was a bit of pressure up there with everyone making me favourite and I made a bit of a mess of things at the start, but pleased with the way I finished it off and happy to get through that 1st Round,” Gary said. He found himself trailing 4-2 and 5-3 after missing key doubles, but Anderson soon found his range and rhythm with some terrific power scoring as he went on a brilliant run to win six of the next seven legs. The Unicorn star flexed his muscles and Bunting just couldn’t respond. Gary hit five 180s and when it mattered at the business end, he also found crucial scores of 174 and then 177 to set up a crucial break of throw. Anderson won it on ‘tops’ with his second match dart and now faces Raymond van Barneveld in the last 16 after Barney’s victory over Kyle Anderson. Cullen finally registered his first win on the Winter Gardens stage at the fourth attempt and he did it some style as he demolished Gerwyn Price 10-3. The win moves him provisionally into the world’s top 16 for the first time. He raced into a 7-0 lead against an out-of-sorts Price....the highlight was a sensational 170 finish in the seventh leg and Cullen was in cruise control throughout. “It took me longer to break my Ally Pally jinx but even so, this is a great relief and it is about time I went deep into a TV tournament. This is the perfect platform for me,” he said. White was too good for German Matchplay debutant Max Hopp. The Unicorn man now faces Mensur Suljovic in the last 16. Despite taking 10 darts at doubles to win the opening leg, he found the important shots when it mattered. Hopp actually broke first to lead 4-3 but a run of five consecutive legs saw White take control. He banged in finishes of 154 and 109 and despite missing six match darts, ‘Diamond’ sparkled with an 8th 180 and D8 to get the job done. But one stat he won’t be pleased with is 31 missed doubles and he know he will have to improve on that against Suljovic. Kyle Anderson was just too inconsistent as he fell to a 10-6 defeat at the hands of Van Barneveld. The Aussie lost six straight legs and trailed 6-1. He did manage to win four out of the next five legs but left himself far too much to do and despite five 180s is on his way home. Elsewhere, Daryl Gurney survived an incredible 11 match darts to squeeze past Steve West 12-10 and set up the 2nd Round clash against Joe Cullen.